Compared to the more universally known G. nivalis, this species is much taller, has larger flowers and much coarser leaves along with a flowering period that can begin a bit earlier. Also, the green spots present on the inner petals are much larger. In borders, rock gardens, under trees and shrubs, and in lawns. Allow the foliage to die back naturally to replenish the bulb's energy for next year's growth and flowers. This will happen by late Spring before the rest of your garden gets going. Under favorable conditions (continous moist soil being the most important) they will multiply very quickly. Fewer and smaller flowers are a sign of overcrowding (this will happen after 3-4 years) and then the clumps should be divided just after the plants have finished flowering and while the leaves are still green. Carefully pull the bulbs apart and make sure to keep the foliage intact. Replant immediately and deep enough; making sure that at least 1" / 2cm of the green portion of the leaves is buried. Build up the soil around the stems for extra support. 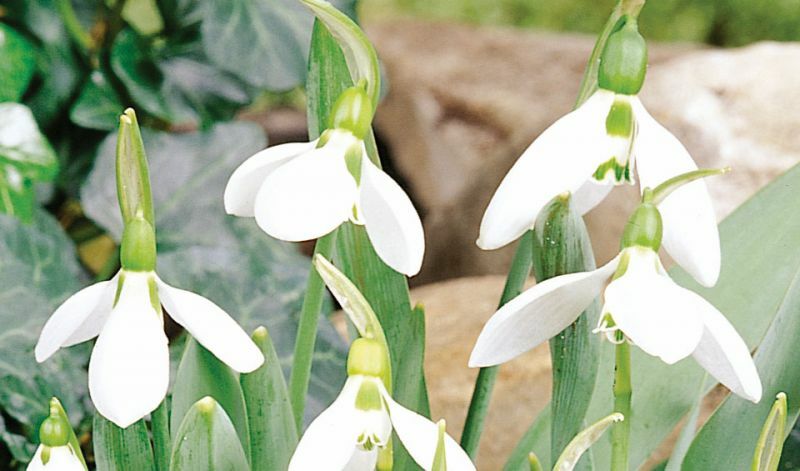 The name Galanthus comes from Greek meaning 'milk white flowers'. With more than 75 species and varieties, snowdrops - practically without exception - all bloom very early in the Spring and have, indeed, milky-white flowers. Some times they are confused for 'snowflakes', however that is the common name for the genus Leucojum.